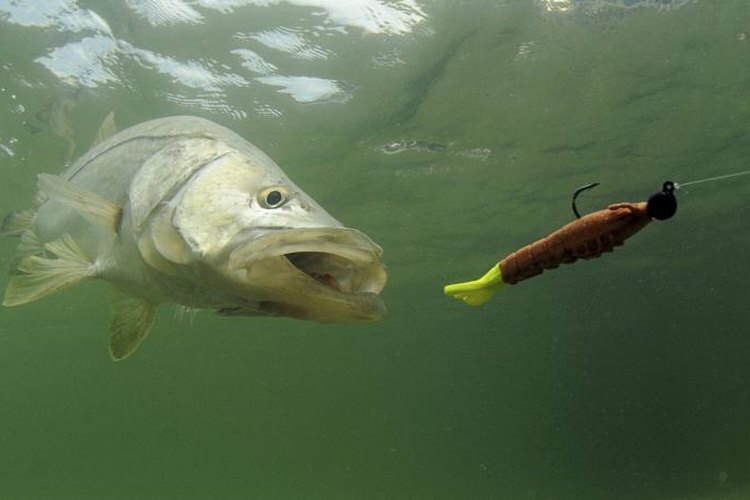 Snook are one of the favorite targets of brackish-water anglers. When freshwater rivers flow head-on into oceans, seas or bays, they create large areas of water with an intermediate salinity. Called brackish waters, these areas often hold a wide variety of fish, and ample opportunities for anglers. You can catch many brackish-water fish in the same manner you normally target them, but try to fish from bridges, use the tides and water temperature to your advantage and learn from the locals to maximize your success. Many of the most common game fish inhabit brackish waters. Freshwater denizens, such as channel catfish, largemouth bass and bullheads often live alongside saltwater species, such as sheepshead, snook and tarpon during portions of the year. In most cases, the same techniques that work for species in their native waters work when they move into brackish areas. For example, bass in brackish water still strike crank baits and plastic worms, while snook often favor mullet heads, regardless of the water's salt content. One of the most popular and effective methods for fishing brackish waters is from bridges. To fish from a bridge, drop a shrimp-baited line into the shaded water below. Use as much weight as necessary to get your bait all the way to the bottom, or you can suspend the bait if the fish are holding up off the bottom. Live minnows are also effective when fishing on a bridge, but you must take care not to let it entangle itself while swimming. The tides affect brackish waters, and wise anglers capitalize on the changing water levels. Typically, the fish bite best while the tide is approaching or receding. Fishing at maximum high tide or minimum low tide is rarely productive. Check the local tide schedule, and concentrate your efforts accordingly. One of the primary stimuli that influences fish movements is water temperature. By knowing the preferred temperature range of your target species, you can better predict their movements and behavior. For example, channel catfish prefer water between 82 and 89 degrees Fahrenheit and avoid water above that temperature. During the late summer, the shallowest regions of some waters may exceed this, pushing the fish towards deeper -- and therefore saltier -- waters. Because brackish regions are subject to strong seasonal variation, it can take a long time to learn the ins and outs of a specific river mouth or estuary. Bass may move farther downstream as the spring rains lower the salinity sufficiently, while sheepsheads may prefer one set of barnacle-covered bridge pilings to all others. Your best bet is to talk to the local anglers, guides and bait shop staff to find some of the best locations and strategies for the area.